Q : What is the Customer Satisfaction Guarantee? At Acakid, we stand by the quality of our tutoring programs. We are very confident that our instructors will have a long lasting impact on your child’s growth and learning experience. That’s why we offer a money-back guarantee: if you are dissatisfied with our tutoring within 7 days of the program start date or 6 hours of tutoring completed, whichever comes first, we will refund your money. Q : What is a “Trial Session”? Acakid occasionally offers new clients a 30 minute free trial session. Your free trial can start any day & time you choose, for absolutely no cost and with zero commitment. After the trial, you may cancel your service, or continue tutoring as long as you need without any contract. Decide if you want Online tutoring or In-Person tutoring. Go to the Acakid homepage and Select and Subject and/or Location. Choose an instructor and a schedule. Submit your request, and we will contact you soon. Once your payment is received, you can meet with your tutor! Q : What does “Acakid” mean? How did you come up with it? It’s short for Academy and Kids! AkariTutoring was our former trademark. The name simply had too many characters and our clients had a hard time remembering it. We thought changing the name would make typing a little easier. Q : What grades and subjects do the tutors cover? Our instructors can cover any Math, Science, Computer Science, Social Studies, Foreign Languages and English subject. Advanced courses, IAAT, SSAT, SAT, ACT test prep, and college level courses too. Q : Do you hire international tutors? No, we only work with US instructors whose alma maters are world class institutions across America. Q : How qualified are Acakid instructors? Our instructors are highly trained professionals with expertise in many fields. Many are driven to become teachers, doctors, engineers, mathematicians, and writers. We select our instructors based on academic excellence from top rated schools, high scores on our qualification exams, prior experience with tutoring, and a passion for sharing their knowledge. Q : Have the instructors undergone any screening? Our instructors have to prove their identity by submitting their government-issued IDs. They have to also pass our face-to-face (either online or in-person) interviews in which we examine their qualifications and abilities to conduct effective lessons. In addition, they need to provide professional references whom we could ask about their backgrounds. On top of that, each tutor can optionally provide their Linked-In accounts, which you will be able to view during the search process. Q : What happens during the sessions? When 1-on-1 instruction begins, our instructors will help your student clarify learning goals and strategize a plan to accomplish them. During tutoring sessions, instructors work with students to clarify concepts taught at school, tackle homework assignments, and prepare for quizzes and tests. Our tutors use a variety of learning tools, including instructional media, quizzes and tests to fully engage students and enhance their understanding. Sessions end with instructors and students discussing how the next session can be even more successful. Tutors also assign homework to help students practice and remember what they’ve learned. As a result of our individualized tutoring technique, students have passed standardized exams and achieved desired college admissions. We have a good track record and receive a lot of positive feedback from our clients! Q : Do you provide materials for my student to use during the tutoring sessions? Yes, we do! And for free! We’ve recently partnered up with leading education companies to acquire very valuable resources from them. We will provide digital copies for curriculum and subject workbooks, test prep books (with the exception of SAT/SSAT books), and other learning resources specially designed to reinforce your student’s understanding and assess their progress. We make sure your student has access to the learning materials they need to succeed! Q : Whom should I contact if there’s any change in schedule, material, etc…? Please contact your instructor directly through our message portal, text, and phone. Our instructors will respond back in a timely manner. If you still need extra help, please contact us below. Q : How can I obtain my tutor’s contact information? Please log in and go to “MY CLASSES“. Your tutor’s contact information should be listed there. Q : How do I leave feedback for my instructor? You can leave feedback when you end the tutoring program on a permanent basis, i.e. when you stop the weekly payment, you’d be prompted to enter any feedback and rating for your tutor. Q : Do I have to sign a contract? Acakid is a zero-contract, and zero-commitment company, because we believe you’ll choose to stay on your own. We have 100% confidence that we will provide you with stellar results, and we don’t need to bind you with a contract to keep your business. Trust us, we trust you. Q : Do you provide tutoring to anyone, anywhere? Yes! With our state-of-the-art virtual whiteboard, online sessions are accessible to anyone, anywhere in the world! For In-Person tutoring, we have instructors available in the following locations: California, Texas, Northern Virginia, Washington D.C., Maryland, Seattle, New York, and Pennsylvania. Q : How much is the cost for tutoring per week? It is simply the hourly rate multiplied by the number of tutoring hours for each week. For example, if a tutor’s hourly rate is $35.00, and you meet her 3 hours/week, then the weekly amount would be $105.00. Q : Do you have an On-Demand plan? Currently we only have the weekly subscription plan. You can cancel the subscription at any given time without penalty. All of our sessions are also backed by 100% Satisfaction Guarantee. Q : When does my credit card (or Paypal) get charged for the first time? Your credit card (or PayPal) will be charged on the day of your first official session after the trial period. If you cancel the pending payment anytime before your first official session begins, you won’t be charged. Q : How does the weekly subscription work? All tutoring is expected to continue on a weekly basis. Every week, you meet with our instructor(s) for the same number of hours. After your first payment, your weekly subscription will begin. Your payments will then be automatically paid to us each week, until you cancel your subscription. Q : So does that mean I will be charged every 7 days? Yes, that’s correct. For example, if you make the first payment on Sunday, then the next Sunday you would be billed for the same amount. You can view all payment history on the transaction page (Log In -> Transaction History). Q : If I book my sessions for Tuesday, Thursday, and Saturday and I make the first payment on Wednesday, then when can I start? Even though you might have submitted the payment on Wednesday, but your credit card won’t actually be charged until the first day of tutoring which is Tuesday in this case. That means you will have to wait until the following Tuesday to start tutoring. To start tutoring within the same week, please make the payment before the starting date. Q : What kind of payment methods do you accept? Q : What if I want to increase/decrease the number of weekly hours? First, please discuss this with your instructor to make sure he/she can reschedule your sessions. Then, cancel your current tutoring subscription, and start a new subscription requesting the same tutor. Q : Why is my card declined? Either your card is expired, or your bank has placed a temporary “freeze” on your account. Please call your bank and clear up the issue. You may use a different card for our service. Q : Why did I receive a message saying that all tutoring has been cancelled? Please check your latest credit card transaction (Log In -> Transaction History). In most cases, your cancellation was a result of a failed payment. You may need to update or change your credit card information. If you still have any problems, please contact us. Q : Should we bring any cash payment? No. Payment should have been processed in advance at the booking stage. This is designed to protect you from any scamming activities, as well as to ensure we can cover you with our Customer Satisfaction Guarantee. Q : How can I enter my promo/coupon code? 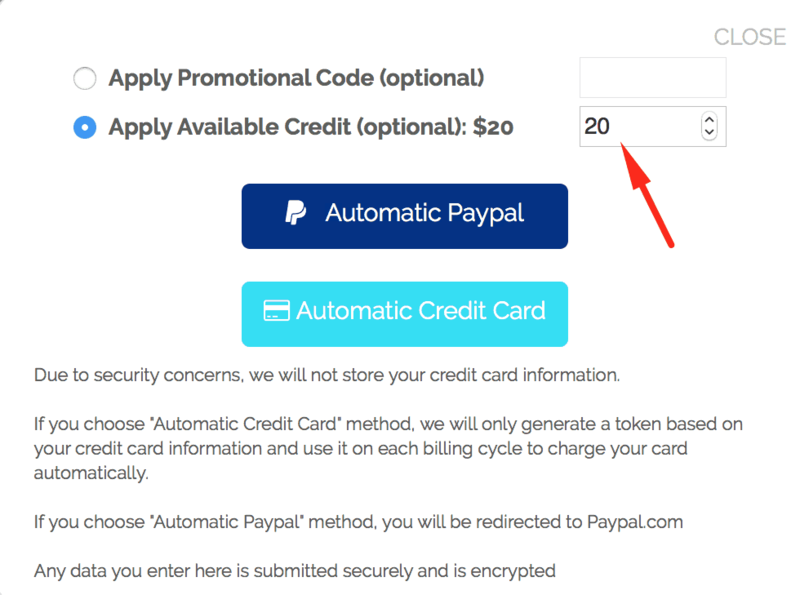 You can add a promo/coupon code on the checkout page when you’re ready to pay. Q : What are referral credits? We’re currently offering $20 credits for any of your referrals who signs up and successfully books a tutor. You can use the credits toward any new booking. You can’t apply the credits toward the currently active payment. Q : Can I exchange the referral credits for cash? No. Credits can only be applied toward the payment for tutoring. Q : How can I enter the credit amount? Q : Will I get charged if I miss a session? What’s the rescheduling policy? We understand unexpected things happen. That’s why, for both Online and In-Person tutoring, there’s no penalty for missed sessions if you notify your instructor at least 12 hours in advance. You can contact the instructor to reschedule or cancel the session and request us to do a full refund. If you do not notify your instructor in advance, and they end up waiting for you, your account may be charged for that session. Q : What if we show up late to the session? Please contact your instructor directly to resolve any scheduling issues. Our instructors reserve the right to leave after 20 minutes of waiting and still charge for the session. Q : What if my tutor doesn’t show up? This rarely happens. Our tutors are reliable and dependable. However, in the case of an emergency and your tutor doesn’t show, please file a dispute and we will expedite your request to issue a refund. Q : Is there a discount for 2 (or more) children? Please contact us if you’d like to add one or two more students. Please provide us the name of the instructor that you’d like to meet, your weekly number of hours, subject, and online or in-person. Q : Can I request for refund? Yes, you can! In cases where you’d like money back for a session due to scheduling issues, and you keep a log of evidence, you can request a refund through Acakid within 7 days of the payment. We will provide the resolution based on subjective evidence provided by both parties. We reserve the right to decline your dispute, or agree to refund fully or partially as detailed in our Terms of Service. Q : How does online tutoring work? Online tutoring takes place in our virtual classroom. It includes live video, audio, messaging, screen-sharing for 1-on-1 communication with your instructors. Your child can use the shared whiteboard for writing, drawing, coding, viewing documents, math graphings, and many more! Q : When and how do I meet my tutor? Q : Do I need to install any software? No, all you need is Chrome or Firefox browser. Our online whiteboard can work seamlessly with these browsers. Q : What is the Chrome’s Screen Share plugin and how do I download it? For Firefox, you don’t have to download any plugin. Q : What if my child is not familiar with the whiteboard? Our online whiteboard was designed with ease of use in mind. In case of any difficulty, our instructors will guide your child to become an expert in no time! Q : Can my child record the session for reviewing at a later time? Yes, there’s a record button which can record the whiteboard actions, and the audio. The whiteboard doesn’t record web cam streaming due to privacy reason. Q : Can my child save the whiteboard screen? Yes, you have various options to save a snapshot of the current screen to your local computer, or to save to our server, which you can view after logging in. Q : Can I try the whiteboard to see if it’s a good fit for my child? Of course you can! Check out the online whiteboard and get to know all the goodies! Q : I’m greeted with the following screen, what do I do next? This screen ensures you have all the tools you need. Please click “JOIN SESSION” to access the whiteboard. Q : Where does the in-person session take place? Our tutors can meet with you either at your home or at a neutral location of your choice such as a library or coffee shop! You can specify the meeting location during the booking. Q : What should we bring to the session? Q : Do instructors take quiz for my child? No, we follow academic honor codes which specifically forbid us from taking any quiz or test on the behalf of your child. We can however help to break down the questions so that your child can understand them at a greater capacity. Q : What if the instructor is late to the session? This would rarely happen, but in such case, please file a dispute with us and we will issue partial or full refund depending on the circumstances. Q : Can we request for tutor change? We will always work for the best of your interest. If there’s any reason that you’d like to switch to a new tutor, please stop the current plan and search for a new tutor. You will be asked to leave feedback for your current tutor. Currently our online whiteboard works seamlessly with Google Chrome and Firefox. When you start a session for the first time, you need to let the whiteboard use your camera and microphone. – A built-in web camera or external USB camera. If the person you’re calling can’t hear or see you, try these steps. Make sure other programs on your computer aren’t using your microphone, camera, or speakers. 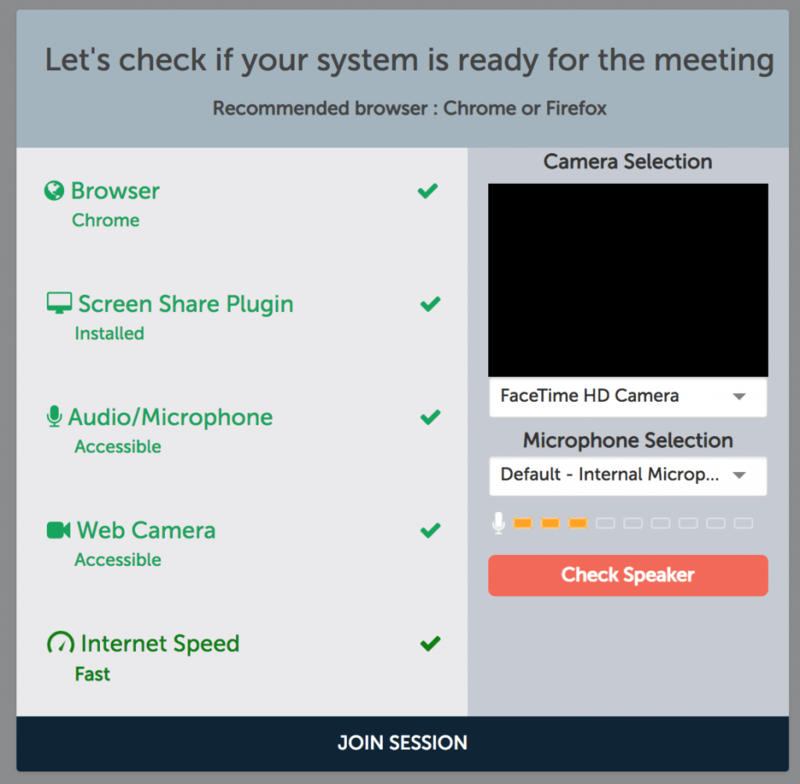 Sometimes another program like Skype would “take over” the microphone in the background, leaving Chrome and Firefox inaccessible to the microphone. In such case, you’d need to restart your computer. If you can’t see or hear the other person, ask them to try the steps above. Please fill in the detail at the Report window. A screenshot can help with technical problems. Please check your internet speed. The download and upload speeds must be at least 4 Mbps. Streaming apps such as Netflix could also reduce the available bandwidth, so you should close such apps before starting your session. You can also try to move the laptop closer to your wireless router, as radio interference sometimes reduces the internet speed. Try a USB or high quality analog headset. The built-in mic and speakers on your computer might not process your audio as clearly as a headset, and built-in microphones can pick up other noise and cause an echo. We recommend using a USB (or high quality analog) headset plugged into your computer. Try lowering the volume of your speakers. The built-in speakers on your computer might be producing the sound that your built-in mic is picking up, which could cause an echo or a high-pitched sound. There could be something in the background that is causing the unwanted noise. If you cannot move away from these sources of noise, then try muting yourself when you aren’t speaking. Mute your mic when you aren’t speaking. If you weren’t able to resolve your feedback issues, then try muting yourself when you aren’t speaking to avoid having the unwanted noise during the session. Q : How do I unsubscribe from receiving text messages (SMS)? Any of these STOP keyword replies will prevent a customer from receiving new messages from the Acakid phone number. Only single-word messages will trigger the block. So, for example, replying STOP will stop the customer from receiving messages from that particular Acakid number, but replying “STOP PLEASE” or “PLEASE CANCEL” will not. Q : How do I re-subscribe receiving text messages (SMS) after unsubscribing earlier? By texting UNSTOP, our system will opt customers back in to the messages coming from Acakid. Q : Does Acakid have any mobile app? Q : How can I apply to become a tutor? Q : Is there any citizenship requirement? No, but you must at least be a green card holder, or with a work permit to work in the U.S.
Q : Is there a minimum number of hours that I have to tutor? No, but if you stay “benched” for too long, we might put your account on hold. Q : Which documentations do I have to prepare? Your latest transcript (if still in college), your resume with professional references, a driver’s license (or any equivalent government-issued ID). Q : Who can view my driver’s license? Only Acakid staffs can view your license. Q : I’ve registered my account, what’s next? Please upload you driver’s license or any equivalent government-issued ID. Q : How do I upload my driver’s license? Please log in and go to MY PROFILE then the IDENTIFICATION section. Q : I’ve uploaded my driver’s license, what’s next? Please proceed with taking the aptitude tests for your desired subjects. Q : I’ve taken my aptitude tests, what’s next? One of our staff members will reach out and schedule a face-to-face interview with you. If you haven’t heard back from us, just send a chat message to us below. Q : I’ve passed my interview with flying colors, what’s next? Congrats! You’re one of us now. Please proceed with setting up your personal info, rate, availability, education profile, etc… You also need to submit to us your completed tax form. Reach out to your mentor or leave us a chat message below to get more guidance if you still have any question. Q : What are trial sessions and do I get paid for those? Acakid sometimes offers our newest clients a 30-minutes session for free of charge. As an Acakid instructor, you will get paid for all conducted sessions (except the ones being disputed), including the trial ones. Q : What is the Dispute process? Acakid values integrity and commitment, and we back that up by providing our clients with a 100% satisfaction guarantee. If a client is not satisfied with the quality of your teaching, they can file a dispute. To keep things fair, you can either approve or reject the dispute, and offer an explanation to defend your stance. If you choose to reject, one of the Acakid administrators will review the dispute and make a decision based on the evidence provided by both parties. If the dispute is found valid, the session will be partially or fully refunded, and that amount will be deducted from your paycheck. Being an Acakid instructor, you’ve already agreed to these terms. This is a fair way to make sure our tutors are regularly delivering the top notch services our clients pay for. Q : I love Acakid! Can I refer my friends? Yes! We’re delighted to work with your acquaintances. There’s a nice cash bonus ($20) for each successful referral! Q : I’ve referred a friend as a tutor, when do I get my bonus? Awesome! Your bonus will show up in the upcoming earning once your friend’s profile gets approved & published by one of our managers, and after that your friend needs to log in the website, review his or her profile once more to complete the process.